Back On Track, a UNLV Foundation program to help students who have fallen behind in school, held its first student recognition event at Western High School with leadership coordinators Denise Edwards and Charitie Bronson. Over 40 students were in attendance. Eighty-two students were recognized—young people who had completed at least one half-credit course that they had been deficient in. Students received Walmart gift cards for every half-credit course they had completed, with some participants completing two or three courses. Andrew was always interested in technology and understanding how machines worked. ITWorks, a job-readiness program, afforded him the opportunity to immerse himself in information technology and launch his career in the industry. Roberto faces challenges not only with school but with English as well. He moved to the United States in the ninth grade and has struggled with school for the past two years. At the end of October, the Communities in Schools site coordinator for his school made up checklists highlighting missing assignments for each student. This data was used to guide homework over the holiday break. Staff from both the Back on Track organization, which helps students who are lagging behind in school to complete their high school degrees, and Communities in Schools, which provides supportive services to help students reach their educational goals, met to discuss the priorities of grant funding awarded by UWSN and WLC. We will continue to cultivate new relationships with regional and national organizations and foundations to provide sustaining support for our Las Vegas programs. One such organization we currently collaborate with, Tech Impact, offers job-readiness programming to people hoping to jumpstart their careers. Taylor Sundall, one of the students graduating from the Tech Impact’s ITWorks initiative, says she was looking for a program to “help me with my passions.” We invite you to read Taylor’s story. 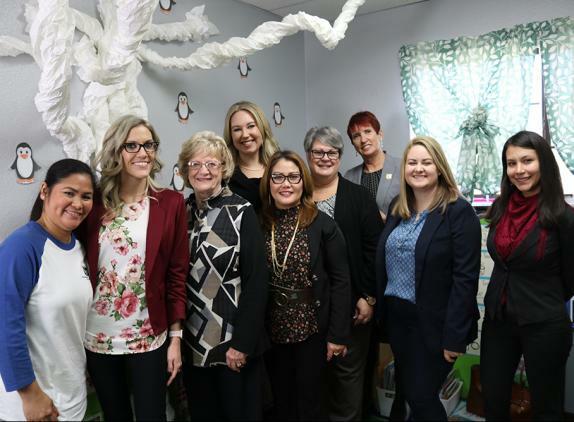 WLC members have contributed more than 48 volunteer hours in support of Spread the Word Nevada, a community-based organization that exposes young children to books. Many thanks to WLC members Holly Lloyd, Rhonda Clausen, and Rosamari McNulty, who lent a hand at last September’s Breakfast with Books event at Taylor Elementary School. Last September’s Day of Caring was a beautiful tapestry of Leaders in Training (a college prep nonprofit), Teach for America, Chicanos por la Causa and UWSN synergies. Leaders in Training, in partnership with Chicanos por la Causa, opened a new office at the Washington Center and welcomed Nevada State College students to volunteer and give back on this one day. The opening itself was only possible through a WLC grant, and the furniture the students assembled as part of their volunteer project was provided through a UWSN grant given to Day of Caring participating agencies. Originally from the Philippines, Grace was unable to attend college due to overwhelming medical bills. Fortunately, she was able to enroll in ITWorks, an information technology training program offered by the nonprofit organization, Tech Impact. ITWorks prepares people for jobs that will then translate into careers. Grace passed the so-called “A+ Certification” with flying colors and is now making her dreams come true.